When I was two years old, my parents got divorced. In other words, I’ve never seen my biological parents spending loving time with each other. I never had the chance to experience the small things most children take for granted. As a kid who didn’t know any different, I thought this was normal. I’d stay with my mom during the week and visit my dad on the weekends. No big deal, that was that. But, truthfully, the reason for the divorce still saddens me to this day. The primary reason my parents divorced is because my father was a workaholic. Because I’m expecting to be a first-time father myself in a few months, “workaholic” is a word that’s at the top of my mind. I’ve thought deeply about how to avoid being labeled a workaholic, especially in today’s world where being a workaholic is synonymous with success. But, as I’ve thought about it more, I realized that’s the close-minded, dualistic way of looking at things. My shift in mindset from an “either/or” to a “how can I be creative to incorporate both?” has been the first step. And, as I’ve continued to grow and reframe my limiting beliefs, there have been a few more realizations about maintaining a work-life balance. Here’s what I’m learning. No matter how I slice it, I only have twenty-four hours in my day. In the past, I’ve naturally gravitated toward being as efficient as possible during work hours and doing everything myself. This approach has been supported by an endless amount of tactics to maximize my productivity during the day—tactics that, if I’m being honest, only marginally approve my efficiency. Efficiency only carries us so far. Even if we’re the most productive person the world, we have a limit to the energy we can spend and a limit on our output. As I’ve learned, focusing entirely on efficiency and trying to do everything is the wrong approach. In reality, the people who have figured out how to integrate their family and professional success have done one thing very well: letting go. A couple of years ago, I had reached out to a mentor of mine asking him for advice. He was a highly respected, gregarious person and was pivotal in my early career. I was blown away. It stung a little, but after a bit I realized his “no” made me respect him even more. Instead of talking in the evening, he had asked me to call him in the morning, or to email my questions and he would get back to me within a couple of hours. He defined his boundaries and “let go” of having to please me (and sacrifice time with his wife and kids). For my mentor, having it “all” meant saying “no” so he could have a successful career during the day and cherished family time in the evening. He knows his time is limited, and reduces his obligations to the core of what he wants to accomplish. One of my favorite theories is the law of diminishing returns. Sometimes, this shows up when I work more than fifty hours at my day job and seeing my output decline. Other times, when I say “yes” to too many people and can’t spend quality time with my family. In other words, when I reach a point where the benefit gained is less than the amount of energy invested, it means I’m doing too much. At a certain point for all of us, we need to stop exerting effort to maintain our balance, health, and important relationships, even if it means we’ll stop short of perfection. When we understand the law of diminishing returns we favor progress and learning over perfection. The metric for balance varies too. Sometimes the optimal level of effort is when we’ve achieved “good enough” on a project at work, which allows us to focus our energy on family. Or, other times, it’s achieving “good enough” with family so we can focus more energy on a massive project we’re excited about at work. And once you know what your “good enough” is, you have the ability to ask others to support you so you can free up time and energy for more important things. Whether it’s hiring someone to help you grow a business, having your laundry done for you, or even getting someone to come change the oil on your car at work so you don’t have to waste time driving around. It’s important to note the goal isn’t laziness—it’s effectiveness. For example, there might be times when we have to put in extra hours to get the job done. The differentiating factor is recognizing when to do something ourselves, and when to delegate. Have you ever noticed the power of deadlines? In college, when I had professors set a project deadline, I knew it had to get done. I could cram all I wanted the night before, but no matter what it needed to be finished on the due date. On the other hand, when I have something I need to do “eventually” it gets pushed off…again…and again…and again. In short, Parkinson’s Law pushes us to take action and focus exclusively on the most important items, and nothing is wasted. And when we use Parkinson’s Law (or ask for help, or say “no”) we’re making sure to spend our energy and time in the places that matter the most to us. 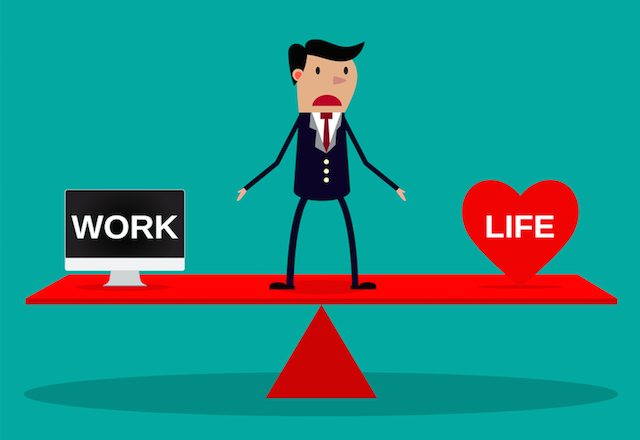 The post How to Improve Your Work/Life Balance and Reclaim Your Time appeared first on Tiny Buddha.